Fitbit is set to update its app later this year to allow women to track their menstrual health alongside the long-standing stats for your steps, heart rate, fitness and sleep. You'll be able to log details relating to your menstrual cycle which will work alongside the data Fitbit normally provides to get a more complete snapshot of your overall health. The new feature will be built into both the newly announced Fitbit Versa and Fitbit Ionic software so you’ll have quick access to alerts about your cycle and period. If you don’t own one of those specific watches but you do use the Fitbit app, you’ll also get the option to track it within the app on your phone. According to Fitbit, the cycle predictions should work dynamically with other health information you log into the app. The idea is it’ll then show you data to help you track and perhaps better understand your menstrual cycle and its patterns. This isn’t the first time we’ve seen apps that allow you to track menstrual health, but it is the first time it has been included in the Fitbit app which is used by millions of people around the world alongside their fitness trackers. 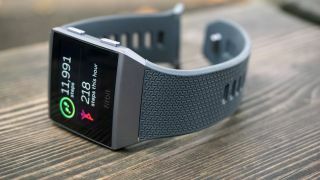 Fitbit just announced the Versa – a new smartwatch that is slimmer and cheaper than the Fitbit Ionic – as well as the Fitbit Ace, which is a fitness tracker designed specifically for children.